↑ Footnote: ভারত সরকার আফগানিস্তানকেও একটি প্রতিবেশী রাষ্ট্র বলে গণ্য করে। This is because it considers the entire state of Kashmir to be an important 'integral part' of the Union of India Jammu and Kashmir itself is disputed territory under the control of India and Pakistan also claims Indian-administered Kashmir. A ceasefire sponsored by the United Nations in 1948 froze the positions of Pakistani and Indian held territory. As a consequence, the region bordering Afghanistan is in Pakistan-administered territories while the remainder is in Indian-administered Kashmir. 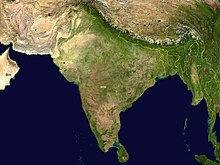 India 4You - Directory of popular Indian websites.